Science notes – with experiments! A summary of several demos I shared with five classes (in a row! harder than I thought) of sixth graders at my son’s school. They were learning about the water cycle, so I did some things about water vapor and air pressure. Water vapor itself is invisible, we can observe it only indirectly by condensation and so on. Important: Please be careful, especially here with eye protection and fire. Losing eyes is bad. Fire can get away from you quickly, and an alcohol flame can be invisible. Proceed at your own risk. Despite my innate desire that everything work just right, I have learned that kids really love hands-on stuff. The trick is to find things that are interesting and safe and usually work even with, uh, offbeat techniques. This little project that I lifted from somewhere-on-the-web illustrates the water cycle. It is quick and cheap and works with kindergartners as well as sixth grade or older kids. Just make the questions more difficult for older kids (vapor pressure is a good topic). The students cover their jars with aluminum foil, pushing the center down far enough to hold several ice cubes. Don’t use too much ice or the ice melt will spill and make a mess. Within a few minutes, water condenses on the foil and starts to drip. Voila, rain. The evaporation and condensation will continue until the water cools and the ice melts, perhaps 30 minutes. The students can prepare the jars first thing and watch them during class. The instructor could do a large version with a 3-liter beaker or so. A nice wrinkle is that the experiment presents all three phases of water. The use of ice isn’t essential, you could use dry ice, liquid nitrogen, knock yourself out. But it does look neat. 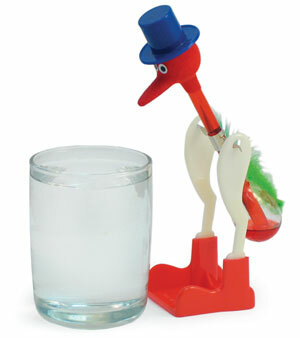 Set up the classic “drinking bird” and explain that it is a heat engine, that is, it converts heat into motion. It is essentially a glass tube connecting two bulbs, the “tail” filled with a volatile liquid. I have a 20 year-old one filled with the now-banned Freon, and a new one uses methylene chloride, nasty for other reasons. They can be purchased for $5. The head is cooled by water evaporation, much as sweat cools our heads. The cooling condenses the Freon or whatever within the bird’s head, such that the greater vapor pressure in the tail forces liquid up the neck. Eventually the top-heavy bird topples, the liquid drains back into the tail, and the cycle starts over. Note that you don’t get something for nothing here — no perpetual motion. The bird removes heat from the surroundings, which is “lost” into the vaporization of water (and it takes a lot of heat to evaporate water). It is not a perpetual motion machine, even if you do replenish the water, because it needs that constant supply of heat to keep evaporating water. Blow air gently over the bird’s head. What does the bird do and why? Use an alternative “drink.” Denatured alcohol (95% ethanol) from a hardware store works great. Dilute it with water to reduce flammability. By the way, vodka — another form of diluted ethanol, ~40% for 80 proof — works, too (use the cheap stuff! adults only). Compare the dip rate of two birds simultaneously. Note that denatured alcohol is normally 95% ethanol plus toxic methanol and other impurities. This renders it undrinkable, to avoid liquor taxes but at great risk to alcoholics. Methanol can cause blindness. Measure humidity, that is, make a hygrometer. Count pecks per minute to calibrate against a working hygrometer. More pecks means less humidity. Is that absolute humidity or relative? Enclose the bird in a large clear bag (or for the classy touch, a bell jar). The bird slows thens stops. Why? Rising humidity “dampens” evaporative cooling that drives this heat engine — the way sweating doesn’t help you on a sticky day — but the change happens so quickly that I think reduced convection or something else is in play. I’d like to try heating or cooling the bell jar with all else constant to see what happens, as the vapor pressure limit increases with temperature. A sling psychrometer measures humidity on the evaporation principle. One thermometer is covered by a wick, the second not. When air is forced over the thermometers, the “wet” thermometer cools. 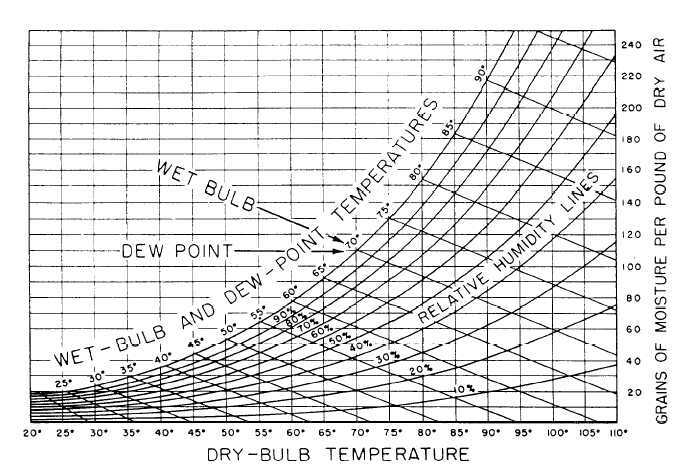 The difference between the wet and dry bulb temperatures and a psychrometric table (below) or chart provides the humidity. Psychrometric table data from the classic Bulletin of the U.S. Weather Bureau No. 1071 (summarized here). Assumes sea level pressure; for variations see NWS humidity tables. Convert to solar: Convert the bird to a radiation-driven “sunbird” by removing the felt and painting the head white or silver (white is a better emitter of heat, silver is the better reflector of radiation — how are these qualities important? What’s the difference between radiation and heat? (There is no such thing as heat radiation!) How would you test?) How would you test it? ); perhaps just cover it with foil and adjust the balance at the pivot. Paint the tail black. Expose to the sun or a very bright light. See also Digitemp.com on building a simple psychrometer. I’ve seen this experiment done with 2-liter soda bottles, but I happen to have a 12-liter boiling flask (hey, who doesn’t?). Next light a couple of kitchen matches, blow them out, and let the smoke into the chamber. I seem to get more smoke when it blow the match out before the head finishes burning. Pressurize again and release. Ta da, a faint cloud. Pressurize and it disappears. Release, and it reappears. The large flask helps with the effect, maybe someone could contrive something like this with an empty aquarium? How about a well-sealed house? The science goes something like: The warm water increases the humidity inside. Blowing (pressurizing) raises the temperature, allowing more water to evaporate, and introduce the humidity of your breath. The loss of pressure cools the air, and suddenly the air is supersaturated. But a cloud forms only if there are condensation nuclei, provided by the smoke. Let a student try it, too. Someone with good breath. First, wear safety glasses. Possible flying glass. Back the kids away from the table. Beforehand draw the tip of a 5 mm. flint glass tube of about a half meter into a nozzle half the diameter. Insert it nozzle first into a stoppered 1-liter boiling flask containing a small amount of water, leaving a space between the tip and the bottom of the flask. The stopper has to be very tight; use some water to get it seated well. I put a ball valve in the second hole in the stopper to increase my comfort level that the flask wouldn’t explode. (Did I mention safety glasses?) Also set out a beaker filled with at least as much cold water as the volume of the flask. Hold up the flask and ask what’s in it. Water, obviously, and air, or oxygen, nitrgoen, carbon dioxide, water vapor, etc., all adding up to atmospheric pressure. Next, heat the water in the boiling flask on a lab stand to, well, boiling. Let it get good and hot. Point out that the white stuff exiting the tube isn’t steam/vapor, rather condensation as the vapor expands and cools. After all, where does the mist go when it disappears a few inches away? A flame held at or near the tube’s tip will eliminate the mist. Remove the heat. Be careful, water touching hot glass will cause a sudden burst of steam and maybe crack the glass. I blew the stopper out once. Swish the water around while it’s still heating to avoid overheated glass. Ask what’s in the flask. Claim there’s almost no air, just water vapor. This may sound odd, given the small amount of water that boils off, but water vapor occupies over 1000 times the volume of its liquid. Ask what would happen if the vapor suddenly condensed into liquid water. At this point the flask is cool and can be safely handled. What If Everybody In Canada Flushed At Once?